We are a full service auto repair center, located in Melbourne, FL. All of our mechanics are ASE Certified and specialize in both foreign and domestic cars and trucks. In 2012 we celebrated our 30th year serving the Melbourne, Florida Area. We stand above the rest being one of a select few service centers that are both a AAA Approved Auto Repair facility and a Bosch Authorized Car Service Center. We work on all makes and models, American, Asian and European. Our Techs are all ASE certified, each with over 25 years experience. We look forward to helping you with all your service needs! ASE Certified Mechanics - 9 Bays to serve you fast. We Work on All Makes & Models, American & Foreign, Gas & Diesel. 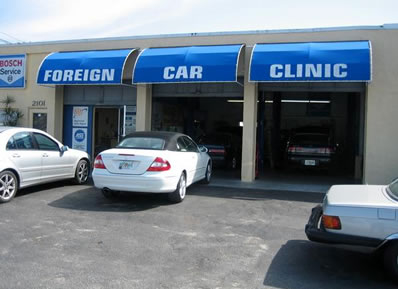 "The guys at Foreign Car Clinic are honest and great people to work with"
"AAA approved and 1 of approximately 1000 Bosch Service Center Locations in the US"
"An Experienced Fair and Honest Auto Repair Facility Serving Melbourne Florida for over 25 Years"
We are a full service auto repair center, located in Melbourne, FL. All of our mechanics are ASE Certified and specialize in both foreign and domestic cars and trucks. In 2012 we will be celebrating our 30th year serving the Melbourne, Florida Area. We stand above the rest being one of a select few service centers that are both a AAA Approved Auto Repair facility and a Bosch Authorized Car Service Center. We work on all makes and models, American, Asian and European. Our Techs are all ASE certified, each with over 25 years experience. We look forward to helping you with all your service needs! ASE Certified Mechanics with 9 bays to serve you fast. We work on all makes and models, american and foriegn, gas and diesel. © Copyright 2013 by Insight media. All Rights Reserved.